Mazagon Dock Limited is going to recruit fresher candidates in India for Senior Engineer, Chief Manager Posts. So, those candidates who are willing to work with this organization they May apply for this post. Last Date of Apply 11-May-2017. Total numbers of vacancies are 37 Posts. Only those candidates are eligible who have passed Full-Time degree in Engineering in Mechanical/Electrical with minimum First Class or 60% Marks or equivalent CGPA from a recognized University/ Deemed University or Institute recognized by AICTE OR Full Time degree in Naval Architecture or degree in Engineering with full time Post Graduate Diploma in Naval Construction with First class or minimum 60% marks in both, Degree and Post-Graduation level or equivalent from a recognized University. 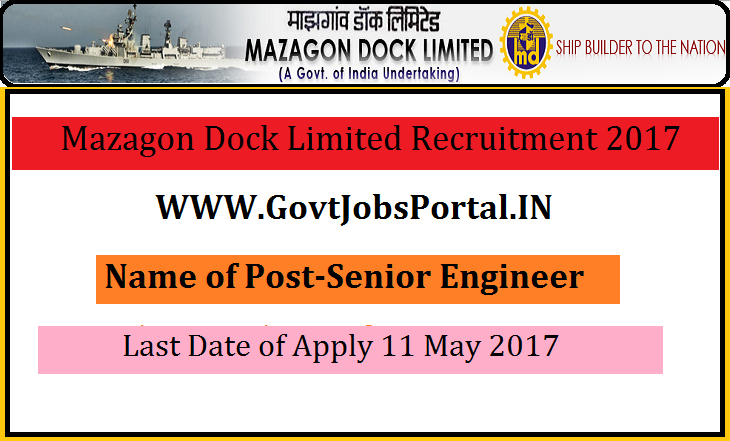 Indian citizen having age in between 20 to 46 years can apply for this Mazagon Dock Limited Recruitment 2017. Those who are interested in these Mazagon Dock Limited jobs in India and meet with the whole eligibility criteria related to these Mazagon Dock Limited job below in the same post. Read the whole article carefully before applying. Educational Criteria: Only those candidates are eligible who have passed Full-Time degree in Engineering in Mechanical/Electrical with minimum First Class or 60% Marks or equivalent CGPA from a recognized University/ Deemed University or Institute recognized by AICTE OR Full Time degree in Naval Architecture or degree in Engineering with full time Post Graduate Diploma in Naval Construction with First class or minimum 60% marks in both, Degree and Post-Graduation level or equivalent from a recognized University. Age Criteria: Candidates age limit should to be possess minimum age 20 years & maximum age 46 years. What is the Process for Selection this Senior Engineer job? Applicants who meet with all eligibility criteria related to these Graduate Pass jobs will be selected on the basis of their performance in various round of selection. The various rounds of selections are as follow: GATE 2016/2017 Marks or Personal Interview. What is the Application Fee for these Senior Engineers?